This document is intended for original equipment manufacturers (OEM) and BIOS vendors creating products based on the mobile 4th generation Intel® Core™ processor family I/O. 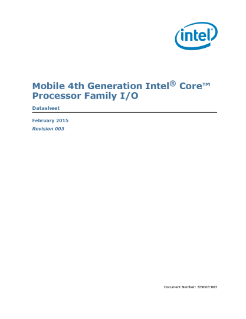 Throughout this document the Platform Controller Hub (PCH) is used as a general term and refers to all mobile 4th generation Intel Core processor family I/O SKUs, unless specifically noted otherwise. This manual assumes... a working knowledge of the vocabulary and principles of interfaces and architectures such as Peripheral Component Interface Express* (PCIe*), Universal Serial Bus, Advanced Host Controller Interface (AHCI), serial ATA (SATA), Intel® High Definition Audio (Intel® HD Audio), System Management Bus (SMBus), Advanced Configuration and Power Interface (ACPI), and Low Pin Count interface. All PCI buses, devices, and functions in this manual are abbreviated using the following nomenclature; Bus:Device:Function. This manual abbreviates buses as Bn, devices as Dn, and functions as Fn. For example, Device 31 Function 0 is abbreviated as D31:F0, and Bus 1 Device 8 Function 0 is abbreviated as B1:D8:F0. Generally, the bus number will not be used and can be considered to be Bus 0.